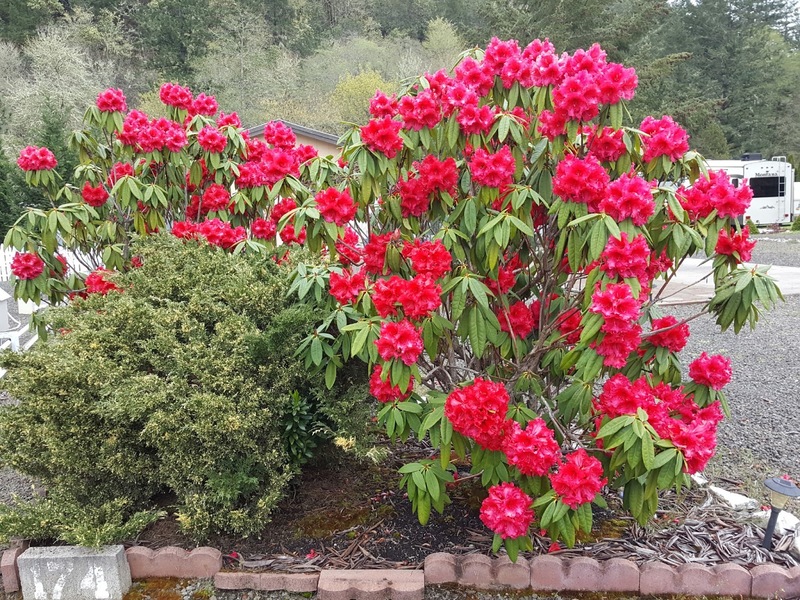 The Azalea and Rhododendron were just blooming at Timber Valley in Sutherlin, Oregon. A beautiful stained glass logo for the Escapee park. A larger window of stained glass is also in the main meeting building. This is perhaps the nicest Escapee park in the organization. Large sites, less expensive state--no sales tax, and close to the coast, outdoor destinations like Crater Lake, National Forests, and great fishing, rafting rivers for just a start. This may be the most popular Escapee park also because of its ideal year round weather. 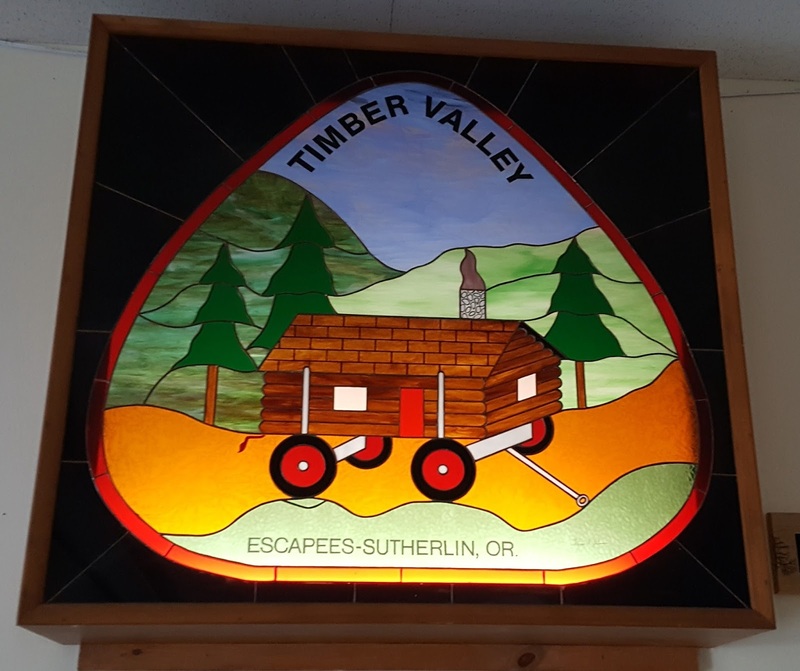 From Sutherlin, it is an easy on ramp to Route 5 north and Cottage Grove. This is a town noted for the covered bridges in the area. There are scenic car routes and bike routes that cover a number of miles and bridges. This bridge is the last remaining fully covered railroad bridge this side of the Mississippi River. 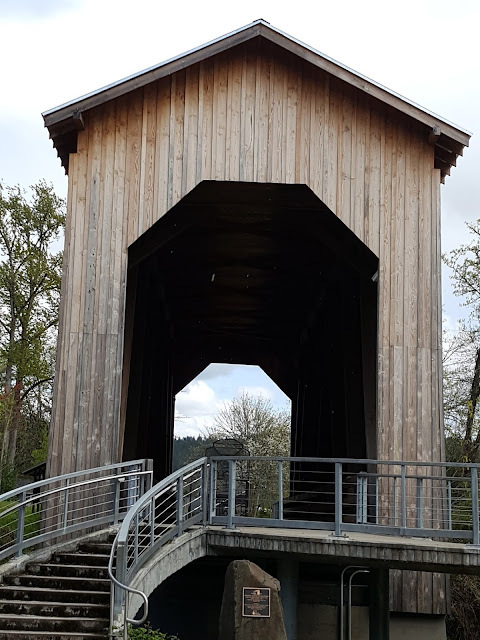 In the later 1800's these bridges were carrying the timber that was and is in great supply in Oregon. They were covered to protect from Oregon's wet climate. For instance , we have seen about three weeks of mostly constant rain with a forecast of rain from now to at least next weekend. 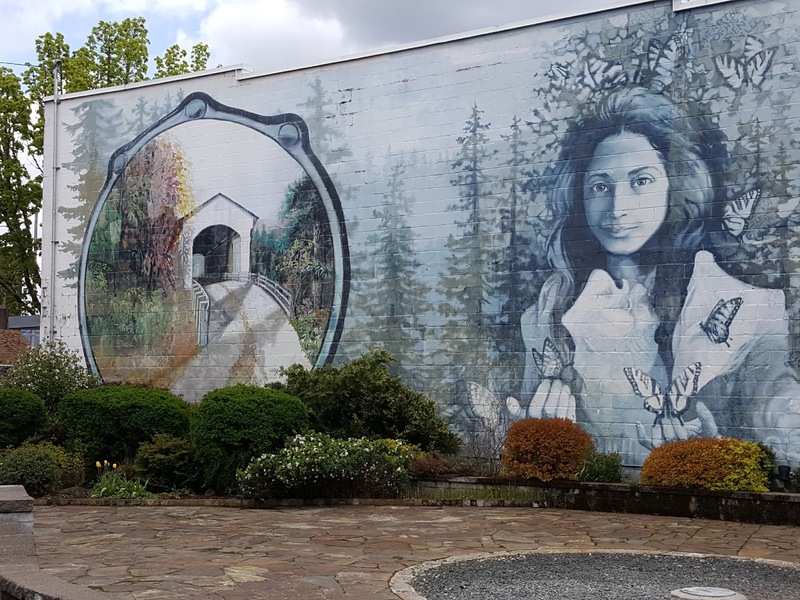 A large mural on the side of a building in downtown Cottage Grove. The girl is Opal Whitely whose diary,The Story of Opal ,became famous in 1920 in the Atlantic Monthly. She was a child prodigy and a naturalist who was capable of memorizing and categorizing vast amounts of information on plants and animals. We stayed at the Village Green Resort , which is an older lodging well known for its gardens. 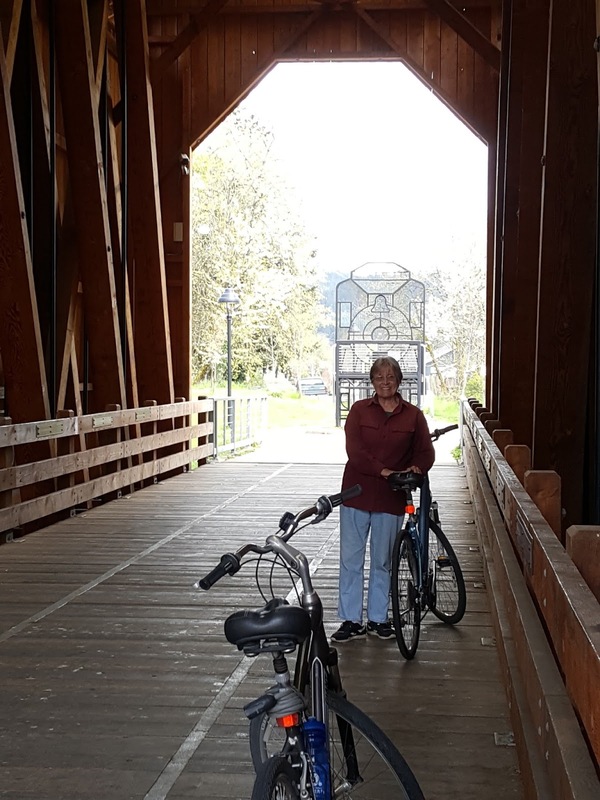 It also has a very small RV park attached which gave us access to bike riding into town, or---if the weather had been better--30 miles or so of covered bridges. It also had a very nice lounge and restaurant that allowed us to have a very nice dinner and walk back to Lady Blue. 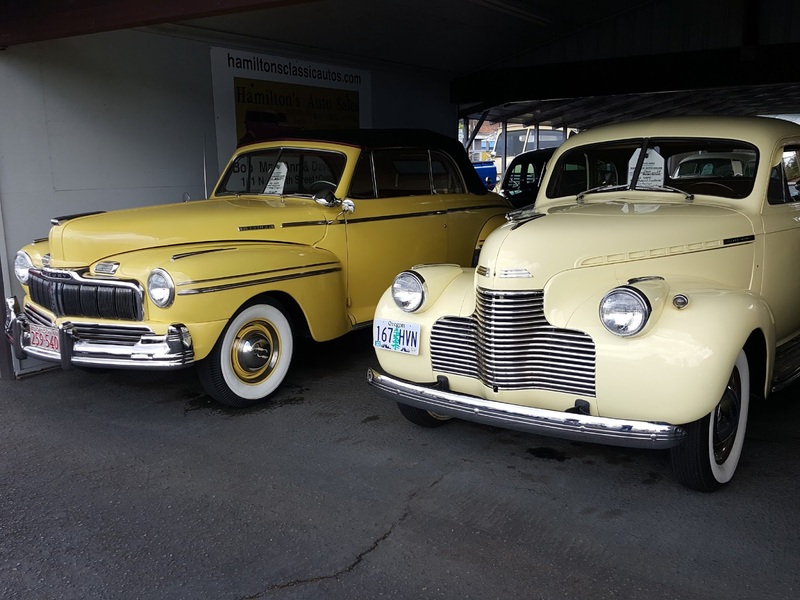 We did bike into town for two of the bridges, a look at the downtown, and this interesting classic auto sales business. 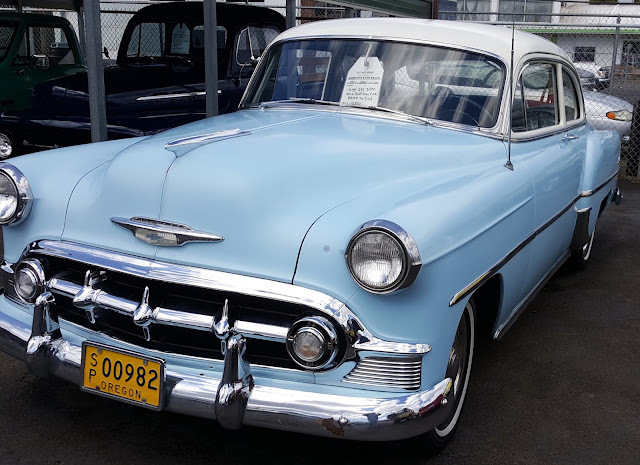 The above is a 1953 Chevrolet that reminded me of my first car, a 1951 Chevy two door deluxe model--two colors!!!. I paid $100 for my 11 year old car. 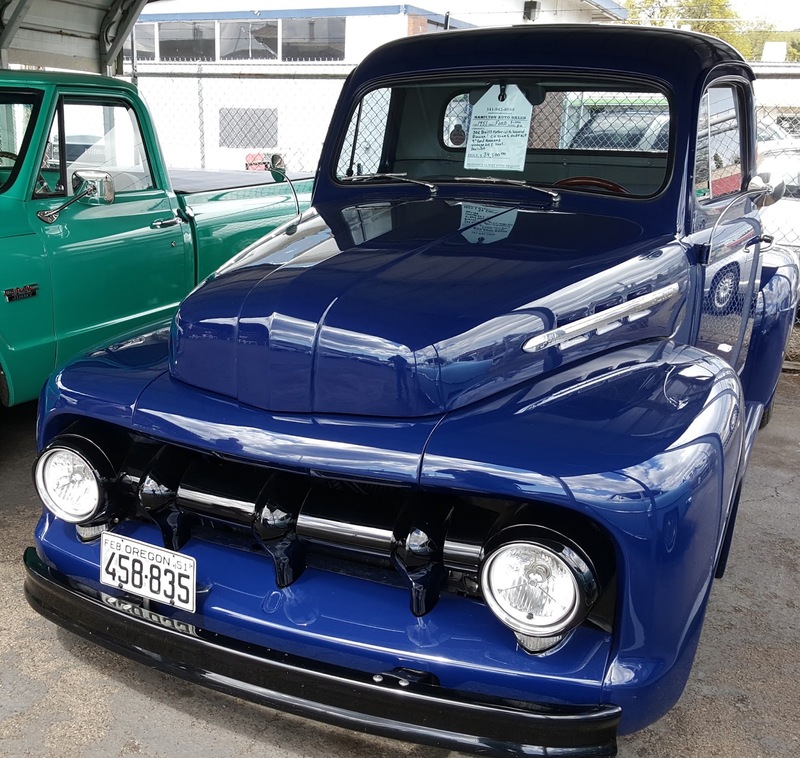 This 1953 is asking $12,900. The owner indicated that a number of his sales are older 1920's cars that he ships to customers overseas. 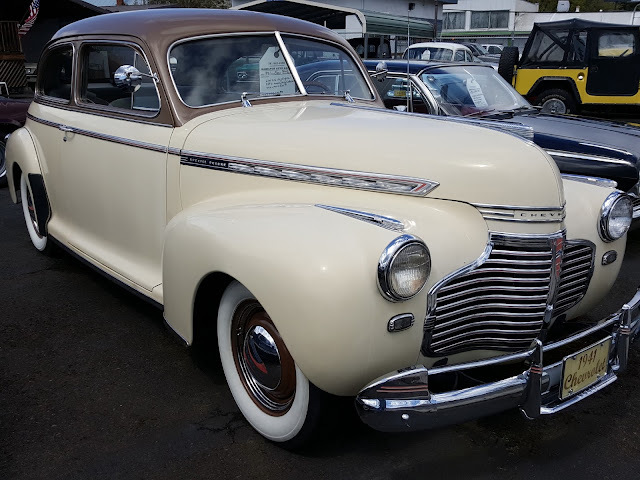 A great 1948 Mercury Convertible. You can imagine it being driven by some film star in old Hollywood. To the right is a 1942 Chevy. 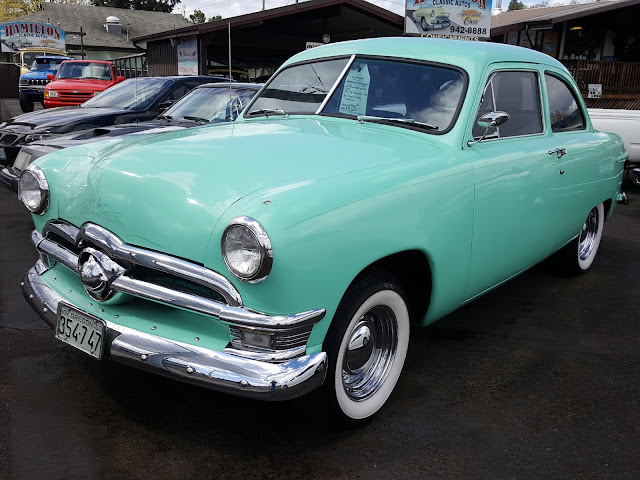 And the last one, a 1950 2 door Ford coupe modified. These are some of the cars we would see when we were kids. And, since the styles were so unique, we all knew what the model and year might be for each. So, Uncle Clifton, this one was sitting on the rails in town with the circle that says "zero injuries" and the insignia "Central Oregon Pacific." From Cottage Grove it is a very short drive on Route 5 north to Creswell. Here we stayed at Meadowlark campground. This is a former KOA campground that is being renovated. The spaces were very level, the laundromat clean, and the office quite helpful. 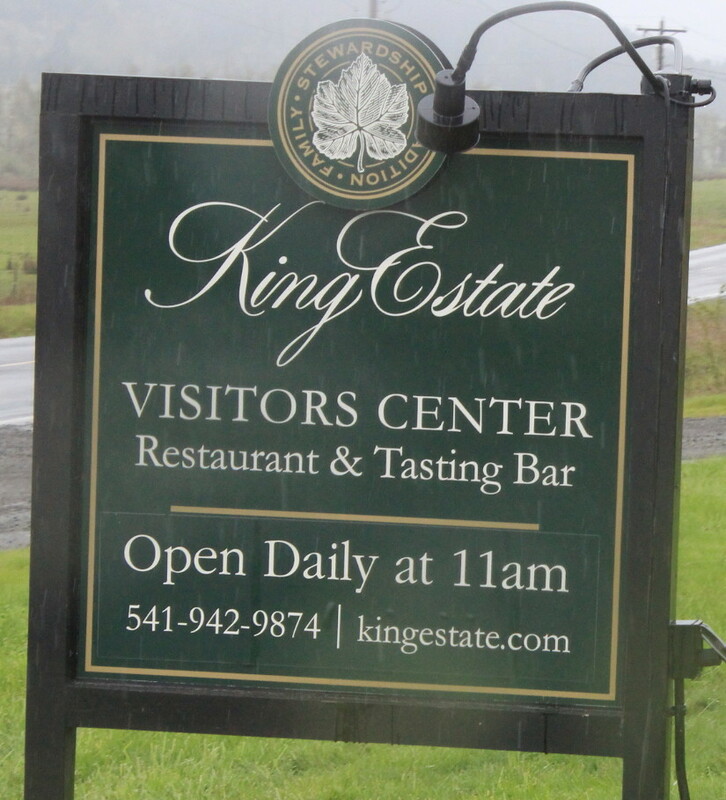 Right nearby is King Estate Winery. We simply followed the main street out of Creswell west to Territorial Highway south for 2 miles. 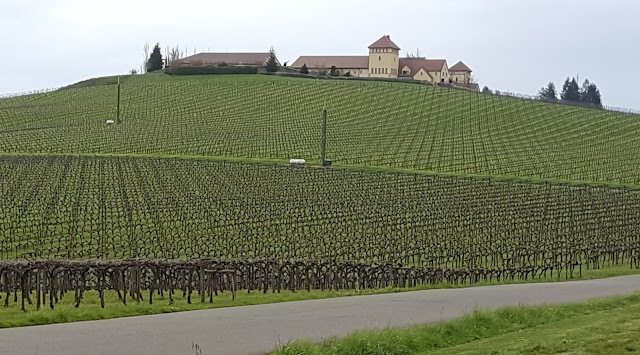 Above is the view as you approach the estate. We were enjoying our visit so much that we forgot to take pictures inside. 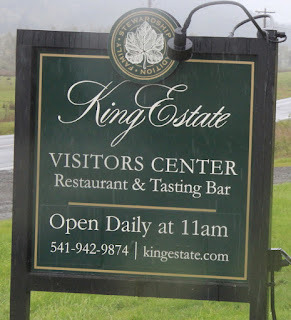 Our wine host was very informative and answered with great patience all of our questions about the vines, Oregon wine, the weather , and much more. In addition, there was a great restaurant right there. Double click on the menu above to read. 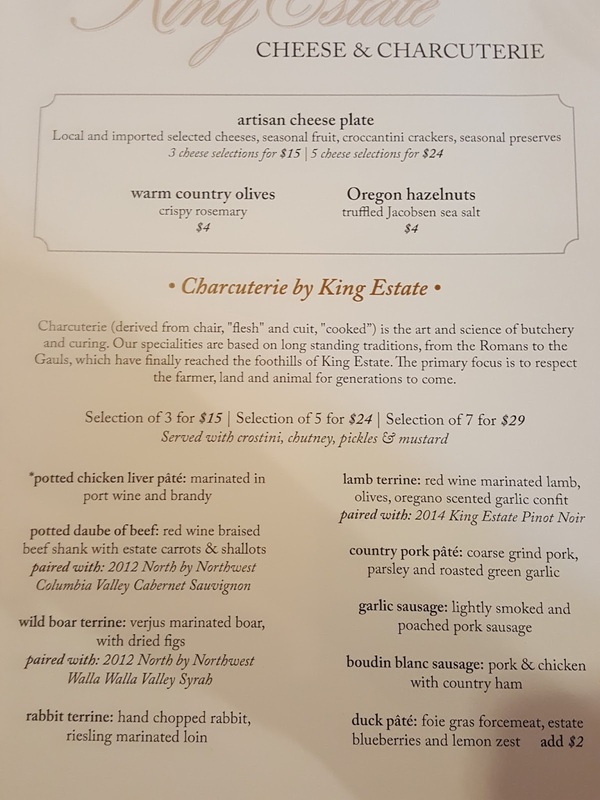 Jan and I had the Daube of Beef, Rabbit Terrine, and Lamb Terrine. The other choices looked quite tasty as well. Of course we had to also have that with their famous Backbone Pinot Noir. For Backbone Pinot, check under "Vineyard Designate Wines"
The first column of "Explore the Estate" dropdown menu gives a lot of information. 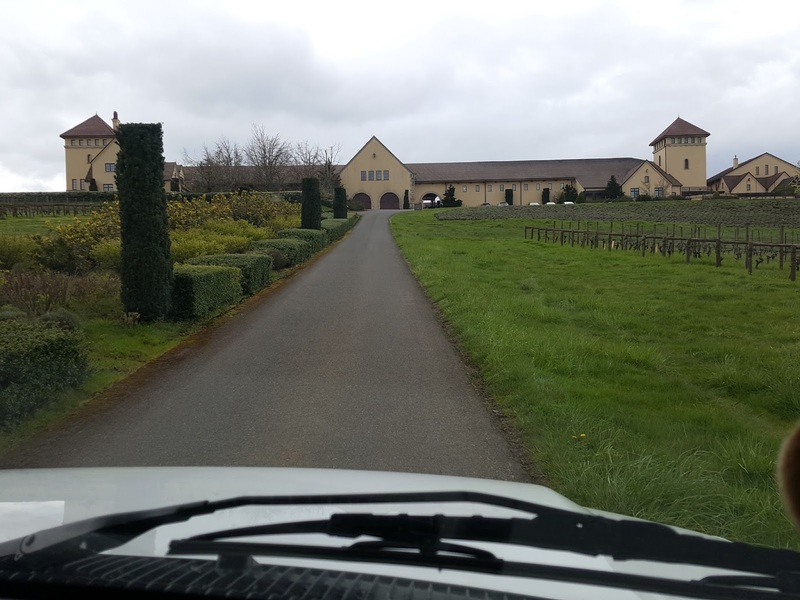 This is the beginning of our sampling of wines from the Willamette valley. A view of some of the 1,000 plus acres on a very rainy day. Like other vineyards, a large flock of sheep are charged with maintaining the grass. Okay----Emilie and Madison--use your imagination. How would this road be on a dark and stormy night? How about if it were a foot path instead of a paved road? A little spooky! We had a great ride on the back roads . First on the same road west out of Creswell , right on Territorial Highway to Route 126 west above. Of course, first we had to stop at a wonderful bakery in Creswell. Delicious open apple pie, ciabatta bread, french loaf, and the very best meat pie. You really should click on the link above and scroll down to see what this small town bakery offers. Note the owner was schooled at the Culinary Institute in New York. We noticed that all the workers were in great moods, an all young group in their 30's and very helpful. Highly recommended! As we get closer to Florence on the coast, we note that we are following the Siuslaw River--after the tunnel, of course. We decide on a Lane County Park campground, Harbor Vista. 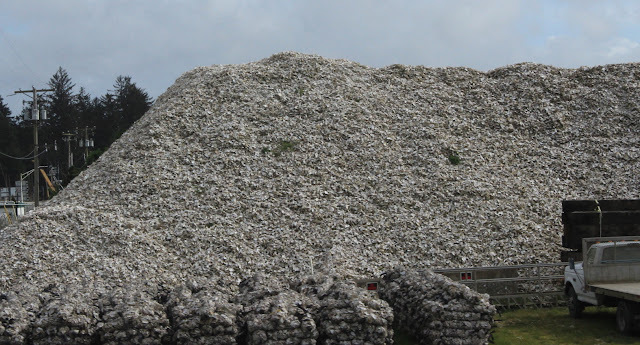 This is just north of town off Route 101. 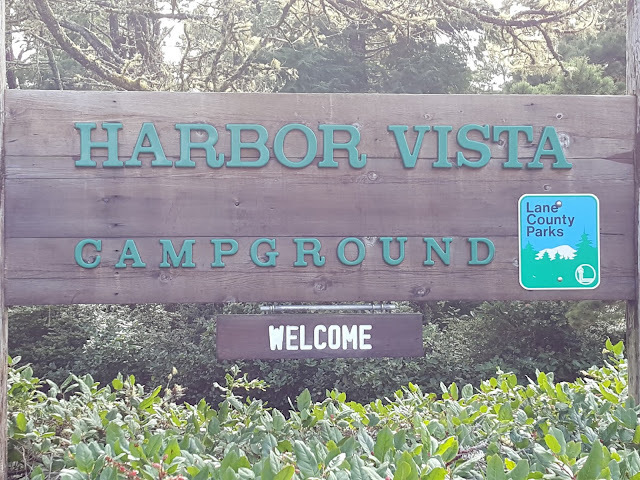 A great campground, we take a very private dry camping site. We had planned only a few days in this area, but a small dental problem extends our stay to 6 days--hopefully. With the extra time , Jan and I take a ride into the old town area of Florence. 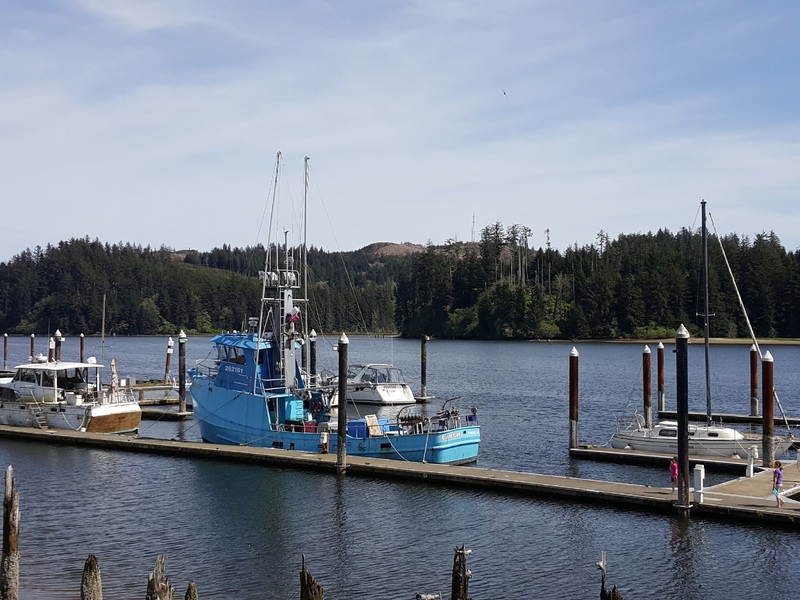 This is right on the Siuslaw River with shops and restaurants. A lot of classic cars earlier in Cottage Grove, but this one in Florence is the all time classic by our estimation. 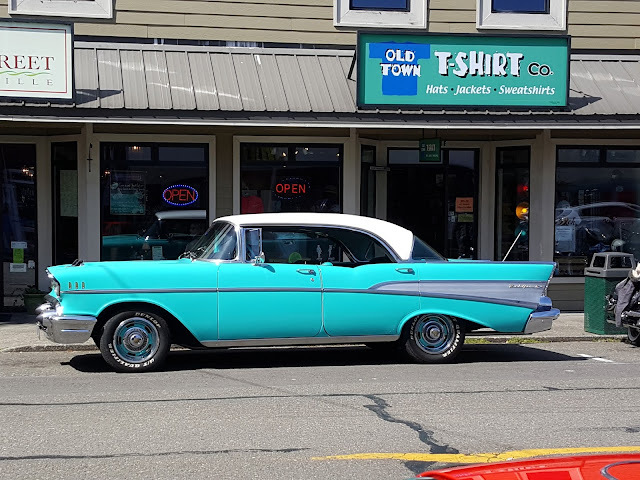 A 1957 Chevy Bel Air. 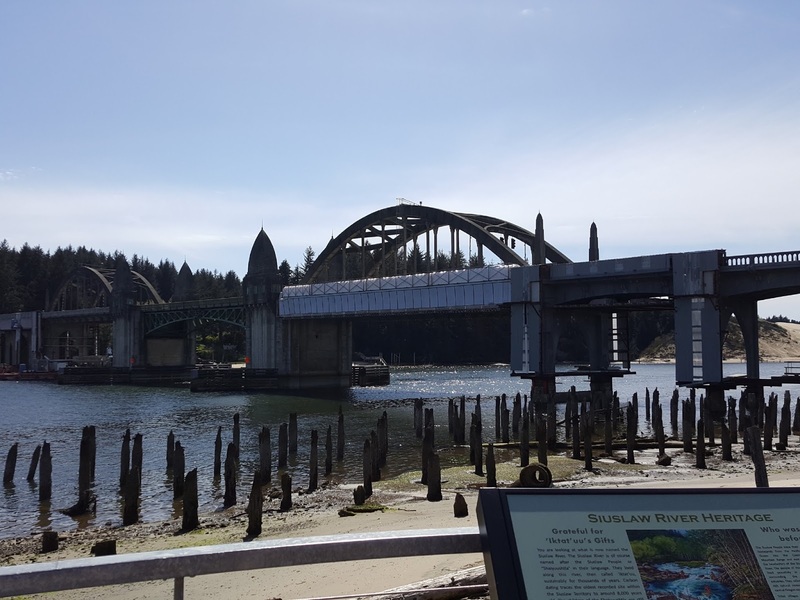 From the Old Town this is your view of the Siuslaw Bridge for Route 101. Some of the piles of oyster shells at Charleston. 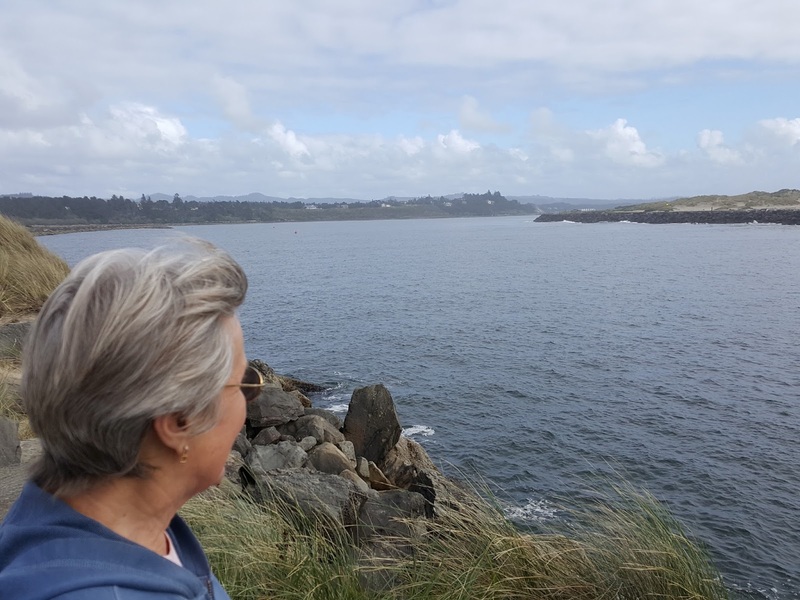 The second day, we had plenty of time to drive south on Route 101 and retrace some our steps three years ago. We drove south to Coos Bay and over to Charleston and Cape Arago. We stayed here three years ago at Sunset Bay State Park. On the way back , heading north, we stopped at Winchester Bay. There is a good RV park here right on the water. Beware though, there are some that are not so nice. Check your reviews for the top rated one. Winchester Bay RV Resort was one with great reviews and right on the water. We decided to try a well rated small restaurant , Griff's on the Bay. The restaurant was small, but we arrived at the end of their busy day with good available seating at the windows. Jan had some tender , broiled fresh scallops and Bruce had fresh fish and chips with a local Deschutes Hop Slice Summer IPA. The first time using a Facebook page for a restaurant. 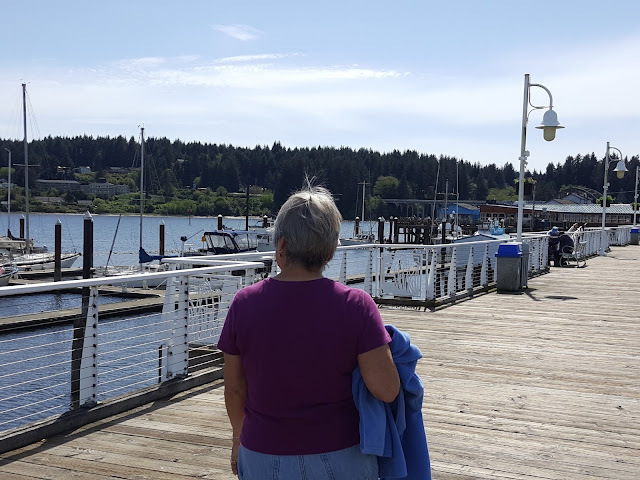 A view from the Jetty back towards Florence, Oregon.